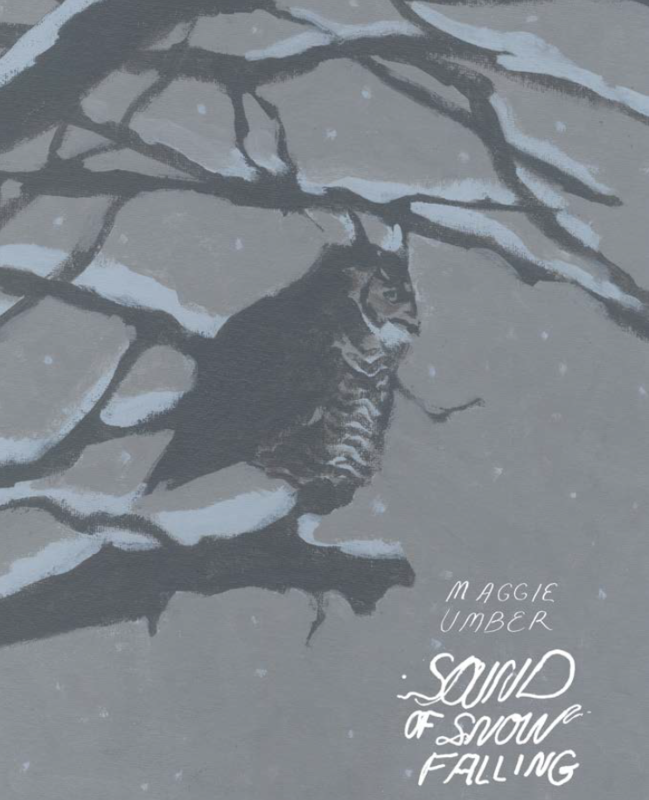 Maggie Umber is one of the unsung heroes of art comics. Her status as the assistant publisher at 2dcloud led to the expansion of an anthologies-based print collective to a significant force in alternative comics publishing. The micropress is a bustling, risk-taking enterprise that wouldn’t exist without Umber’s hard work. Over the course of 2dcloud’s 10-year history, Umber has published only a small amount of work, but her graphic novella Time Capsule was one of my favorite books of 2015. At the time I called it a punch in the mouth; it’s stark view of the natural world and the peril it faces due to the effects of the anthropocene, including encroachment, poaching, natural resources depletion or pollution, and climate change. 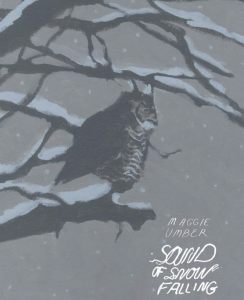 This Spring, Umber published Sound of Snow Falling, another nature-inspired graphic novel from 2d cloud. In it, Umber details the lives of a mating pair of great horned owls in their natural habitat, along with other animals around them. My first impression of Sound of Snow Falling is its darkness. Not, necessarily, in the telling of the tale, but in the colors and techniques Umber uses. Great horned owls, a very common predatory bird in North America, are crepuscular/nocturnal animals, and Umber has limited her color palette to match the surrounding darkness of her subjects.The book opens with a gorgeous set of pages, illustrating a flock of turkeys in various shades of grey and navy. Some maroon sneaks into the palette at places, but cool dark colors predominate. In this way the book feels cold, like opening the pages leads to a world of winter night. Sound of Snow Falling is a wordless comic (except the foreword and afterword), which gives the comic a sense of quiet that predominates. The title recalls the muffled stillness of a snowstorm, how sounds are subdued and dispelled. Without the baggage (or crutch) of language, Umber must find a way to craft a compelling and propulsive narrative. Part of the way Umber accomplishes this is through careful color considerations. Scene by scene, the background color, often used in panel gutters, changes. 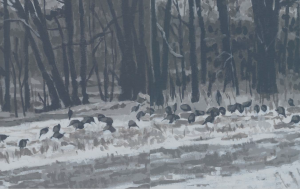 There are also scenes where the animals are hard to see, their natural camouflage expressed in the dark paint tones. I was mesmerized by Umber’s control. Umber does a lot with two page spreads that I find compelling. There’s a challenge here, not a big one, but a meaningful one, of what comics look like and what they can be. Some of my favorite work in the book is early on, where owls perch in trees in a swath of blue. 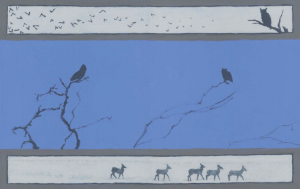 Above them, in a panel of light grey, a flock of birds (or bats) flies overhead; below them, in a similar panel, a herd of deer cross a snowy plain. The heavens above and the earth below, and Umber’s central characters, the watchful guardians of night. As I read Sound of Snow Falling, a general question surrounded the work; How do we create compelling narratives of the animal world that do not humanize these animals and their lives? Animal documentary film, with its over reliance on narration as a method of narrative propulsion, humanizes the wild. Other narrative work in comics gives animals names, human emotions, and human smiles, robbing the creatures of their majesty and their violence. Umber easily avoids this common pitfall in Sound of Snow Falling, and the result is astounding. Sequential State is a nonprofit alt comics criticism project. We’re running a Patreon campaign that supports the website’s hosting costs. Extra money goes to paying cartoonists and other writers. That’s the gig. There’s no affiliate links, and no advertising. Was your reading experience today worth a buck? If you thought so, then please help me keep the site up and running. Thanks.